The business landscape changes daily and with that comes new “buzzwords.” You know those ones that really bug you – those where you kind of know what they mean, but they can mean lots of things and different things to different people. Well let me share one of mine with you: “servitisation.” In my opinion, this term captures so many of the other current industry terms and buzzwords around Industry 4.0, digitisation, IoT, mobility and much more. One definition of servitisation is the strategy of creating value by adding services to products or even replacing a product with a service. One great example of this can be drawn from the aerospace industry, where a jet engine can be sold as units of time to power a plane (“power by the hour”) rather than the capital cost of buying the engine itself. Servitisation can only be viable or profitable when an organisation has a true understanding of the products and services it provides throughout its entire life cycle. This means knowing every aspect of the true production cost, logistics, operating environment, performance and life expectancy throughout its operational life. In simple terms, it is having the power to know what operational data and digital footprint a device or service has. This provides the insight needed to effectively manage and cost a servitisation offering effectively. Many organisations are familiar with the term “big data” that represents data in volume, variety and velocity – but very few organisations know how to manage this data and extract the right level of insight and value to adopt this type of strategy. Many organisations believe that servitisation is just a commercial model similar to leasing, but the granularity needed to drive it needs to join the operational gaps between departments and sometimes external business partners. 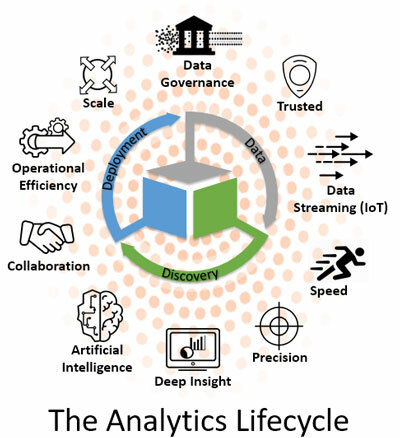 What is needed is a focus on the data, the foundation of servitisation, and how to extract value from that data quickly through an “analytical life cycle.” Organisations need to leverage advanced analytics as a platform rather than a point solution like many organisations have done before. By taking this approach businesses can connect processes and capabilities around monitoring machines, systems and data in the make process, and can join this to post-production analysis around forecasting and supply chain processes to aid future planning. This is paired with data-driven analytical approaches to customer engagement and post-sale monitoring of product performance, service requirements and infield product satisfaction. This would unlock many organisations’ ability to achieve servitisation capabilities. There are many businesses out there that have adapted well and diversified or moved to a servitisation strategy (Apple, Google, Rolls Royce, GE, Siemens to name a few). But even organisations like these are still evolving and will continue to evolve. You don’t have to be a multibillion-pound business to take advantage of this approach – you just need to have a clear understanding of what your customer wants, what capability you have, what you need to make it a better “experience” and how responsive you can be in the market. Again, companies that are making headway are those that understand the value of data. Organisations that ignore this value and how to extract it will fail. Adopting a servitisation approach will allow organisations to have greater focus on customer centricity; a common term but few can execute this in its true meaning. Traditionally manufacturers would produce a product to a specification needed, then drive value from the quality they can deliver. In a globalised marketplace, competition is greater than ever and customers want more. Manufacturers need to change their mindset and look to how data can not only deliver insight, but also generate new business models. Many successful businesses have invested in operational platforms like ERP, finance and billing systems. More recently businesses have seen extensive value in productivity platforms with office tools and CRM systems. Now the next wave is here: analytical platforms that encompass artificial intelligence (AI) and machine learning to support deeper insight and new levels of automation, driving greater commercial benefits beyond the expected key performance indicators that are traditionally used. This will provide the framework for manufacturers to optimise operational processes, join and collaborate business units and generate new revenue streams. Industry 4.0 – or the next industrial revolution – has become a watchword for manufacturers, and we are not sure the implications are clear to many. Hyperconnected customers are the fundamental premise of Industry 4.0 and they expect more than good quality. They expect their manufacturers to behave like business to consumer (B2C) companies and service providers by delivering that one-to-one relationship. Real-time and predictive engagement is becoming much more of a “must-have” rather than a “nice to do,” as part of any manufacturer’s customer experience. Research we carried out last year across UK industries showed that the majority believed real-time customer engagement could deliver a 10 to 40 per cent increase in revenue. And customers have come to expect a more personalised service. Upwards of 40 per cent of many manufacturer’s total revenue comes from the after-market; much of the inventory costs in a company are held in after-market systems and whether the customer is lost or retained is often the result of after-market performance. This begs the question as to why the after-market is so often an afterthought? Manufacturers must change their approach to deal with the speed of business and complexities associated with today’s global marketplace. Yes, it is people and processes, but it also requires more robust platforms that handle complex data from diverse sources, and delivers actionable insight that drives faster and more accurate decision making. Manufacturing businesses in the UK must act faster, be more open to change and realise the value they already have in their business. Innovate and experiment quickly but design a business around a platform not a bunch of point solutions, as the total cost of ownership will inhibit growth. Focus on the customer more by listening and adapting to change – this will drive greater innovation in how products are made, moved, paid for, used and, more important than ever, recycled. Find out more about how analytics (and other buzzwords!) can add value to your manufacturing business. Tim joined SAS UK & Ireland in the middle of 2015 as an Industry Solution Specialist for the commercial team covering retail and manufacturing. Having worked with the solution software business for over 15 years, he brings with him wealth of experience. Prior to joining the company, Tim worked at IBM as an Industry Solution Specialist focused on the B2B and manufacturing markets for eCommerce, order management and supply chain optimisation. Over the years Tim has worked in many different markets for previous employers like Micros Systems and Torex but started his professional career at Rolls Royce aerospace (civil) as a Mechanical Design Engineer. This really was ‘rocket science’.